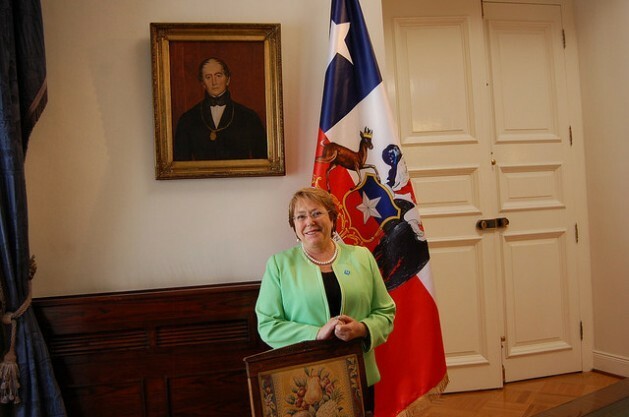 In this exclusive interview with IPS, held shortly before Bachelet headed to the capital of France, the president reflected on the global impacts of climate change and stressed several times that the accords reached at the summit “must be binding,” as well as universal. On Monday Nov. 30 Bachelet will take part in the inauguration of the 21st Conference of the Parties (COP21) to the United Nations Framework Convention on Climate Change (UNFCCC), which will run through Dec. 11. At the summit, the 196 countries that are parties to the treaty are to agree on a new climate accord aimed at curbing global warming. The president also said the Paris summit will have a different kind of symbolism in the wake of the terrorist attacks that claimed 130 lives: “It sends out an extremely clear signal that we will not allow ourselves to be intimidated,” she said. Q: Latin America is a region where the countries face similar impacts from climate change. But it is negotiating with a fragmented voice. Has the region missed a chance for a leadership role and for a better defence of its joint interests? A: Sometimes it is very difficult to achieve a unified position, because even though there are situations that are similar, decisions must be taken that governments are not always able to adopt, or because they find themselves in very different circumstances. We belong to the Independent Association of Latin America and the Caribbean (AILAC) in the negotiations on climate change, along with Colombia, Costa Rica, Guatemala, Panama, Paraguay and Peru. All of these countries did manage to work together, and we have a similar outlook on the question of climate change. The countries in this region are not the ones that generate the most emissions at a global level. And above and beyond the differences we may have, the important thing is that we will all make significant efforts to reduce emissions and boost clean energies and other mechanisms and initiatives. Q: Will the COP21 manage to approve a new universal climate treaty? A: COP21 is not the end but a beginning of a process where the countries will turn in their national commitments [Intended Nationally Determined Contributions (INDCS)]. After that will come the mechanisms to assess the implementation of these contributions, and, from time to time, propose other targets, which would be more ambitious in some cases. This will be the first climate change summit, after the Copenhagen conference [in 2009] where no accord was reached even though the Kyoto Protocol was coming to an end, where we will be able to reach some level of agreement. It might not be the optimal level; apparently the contributions so far publicly submitted by the states parties would not achieve the objective of keeping global warming down to two degrees Celsius. Nevertheless, it is a major advance, when you look at what has happened in the past. That said, what Chile maintains is that the contributions should be binding, and we are going to back that position which is clearly not supported by everyone. Q: So you include yourself among those who believe Paris will mark a positive turning point in the fight against climate change? Q: Chile carried out a much-praised citizen input process for the design of its Intended Nationally Determined Contributions (INDCS), to be included in the new treaty. But media and business sectors were not pleased with some of the voluntary targets that were set. Will this hinder implementation? A: Not everyone always agrees, we’ve seen that in different processes. I hope that awareness grows, and that is a task that we also have, as government. Climate change is a reality, not an invention, which will have disastrous consequences for everyone, but also for the economy. For us it is indispensable, on one hand, to reduce emissions by 30 percent, by 2030. There are some who believe our commitment falls short, but it is what we can commit to today, understanding the economic situation that the country and the world find themselves in. It is a serious, responsible commitment. And obviously, if the economic situation improves, we will set more ambitious goals later. On the other hand, Chile has an adaptation plan that includes, among other things, the reforestation of more than 100,000 hectares of native forest and an energy efficiency programme. A: Yes, in the sense that a concrete, definitive agreement will be reached. But it is, I insist, the start of a path. Later other, more ambitious, measures will have to be adopted, to further reduce global temperatures. Q: Will the treaty currently being debated include the financing that the Global South and Latin America in particular will need in order to help prevent the planet from reaching a situation that is irreversible for human life? A: I have a hope that the Green Climate Fund will grow and give more countries access to technology and resources. In this region we will always have the contradiction that we are considered middle-income countries, and thus we are not given priority when it comes to funding, while at the same time our economies are often unable to foot greater costs. And on the other hand, we are the smallest emitters [of greenhouse gases]. This is why in Chile we have set two targets, one without external support and the other with external financing, to reduce emissions by 45 percent. But there is also a possibility of financing through cooperation programmes for the introduction and transfer of new technologies to our countries, which will allow us to live up to the commitments. Q: As the first executive director of U.N.-Women [2010-2013], you helped establish the idea that women must be taken into account in climate negotiations and actions, because they bear the impacts on a day-to-day basis and are decisive in adapting to and mitigating global warming. What is the central role that women should have in the new treaty? A: There are a number of day-to-day decisions made by women, which have an influence. For example, energy efficiency is essential when it comes to reducing emissions, and it is often a domestic issue, in questions such as turning off lights, for example. But in many parts of the world women are also the ones hauling water or cooking with firewood, especially in the most vulnerable areas. So the importance of women ranges from these aspects to their contribution as citizens committed to the fight against climate change, with the conviction that a green, inclusive and sustainable economy is possible, and to the political role of women at the parliamentary and municipal level, where they are working hard for the adoption of measures and to ensure a livable planet. Q: As president, and as a Chilean, what worries you most about the current climate situation? What would you see as the highest priority? A: There are many things that worry me about climate change, ranging from severe drought and flooding to islands that could disappear under water – in other words, how natural events linked to climate change affect the lives of people. I’m also concerned about two things that are essential for people: clean drinking water and food, two elements that can be profoundly affected by climate change. We have seen that there are areas of the country where people depend on rationed water from tanker trucks. This not only affects the daily lives of people but also, in agricultural areas, it affects production and incomes. And think about the marvelous variety of fish and seafood that we have in our country, which depends on the temperatures in our oceans. All of this could be modified. It is all very important, and ends up affecting people’s lives. Q: Paris was the victim of a Jihadist terrorist attack on Nov. 13, which left 130 people dead. Did these attacks affect the climate surrounding the summit? Will the participation by the heads of state and government also serve as a response to the terrorism? A: More than 160 heads of state and government have confirmed their attendance at the Paris conference, which sends out an extremely clear signal that we will not allow ourselves to be intimidated. We are going to Paris first, because the issue to be addressed and discussed is important, but also because we are sending a message that we will not tolerate this kind of action and that we will continue moving forward in the defence of the values that we believe are essential. And we will give a hug of solidarity to our sister republic, France, to President François Hollande and to the French people.